Ultrasonic Homogenizers help in catalysis or breaking up of cells, bacteria, viruses, spores, fungi, or tissues, and acceleration of chemical reactions, homogenization of substances of all kinds and various other purposes. Ultrasonic homogenizers are also known as sonifier and sonicators that use ultrasonic waves for cells and tissue disruption. An ultrasonic homogenizer consist of a generator which provides and controls the power, a transducer that converts electric energy to very high-frequency mechanical motion with the help of piezoelectric crystals or am amplifier and a titanium probe that transmits the ultrasonic energy to the sample by rapidly vibrating in a longitudinal direction. Ultrasonic homogenizers aid in creating emulsions and dispersion of very small particles such as nanoparticles. Ultrasonic homogenizers generate a huge amount of noise and heat due to large amount of power generation. On account of this, samples need cooling or freezing to be done before the homogenization processing. Ultrasonic homogenizer is a homogenization process that can take place through cavitation or by the means of ultrasonic waves. The combination process of cavitation and ultrasonic homogenization makes homogenizers an attractive choice for the purposes of cell size reduction and cell disruptions. 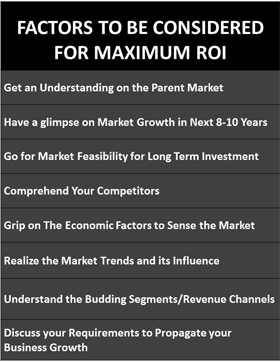 Ultrasonic homogenizers market is anticipated to record a significant CAGR over the forecast period. 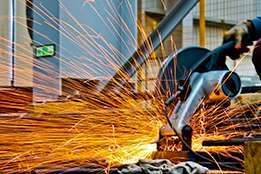 Many multi-national companies are concentrating towards new product advances in industrial ultrasonic homogenizers for efficient output. Moreover, the many advantageous properties of ultrasonic homogenizers are exploited in the field of lubricants and coating, food and dairy on regular basis. 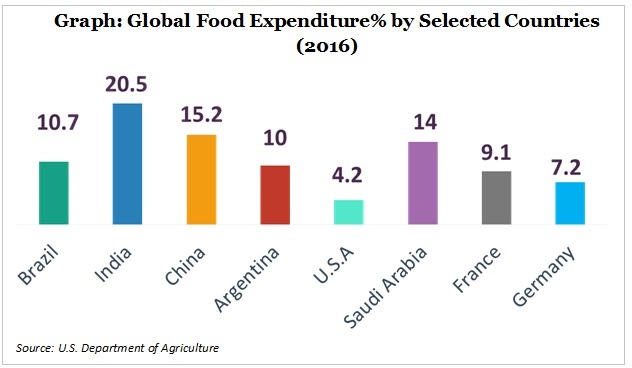 According to U.S. Department of Agriculture, the global food expenditure (%) is shown in the graph which depicts that India is leading by 20.5% followed by China at 15.2%, Saudi Arabia at 14%, Brazil at 10%, Argentina at 10%, France by 9.1%, Germany by 7.2% and U.S.A by 4.2%. This high expenditure in food sector is collaborated with high food safety among consumers which is driving the growth for ultrasonic homogenizers market during the forecast period. The global ultrasonic homogenizers market is observing vivid growth on the back of increasing demand of physically cell lysing equipment in the market. Advancements in bioprocess industry in the past few years and growing technological explorations is projected to drive ultrasonic homogenizers market besides the wide range of functions of ultrasonic homogenizers in an immense range of applications such as ingredients extraction, production of the finest emulsions with minimal droplet size, DNA/chromatin cutting or lysis and others during the forecast period. 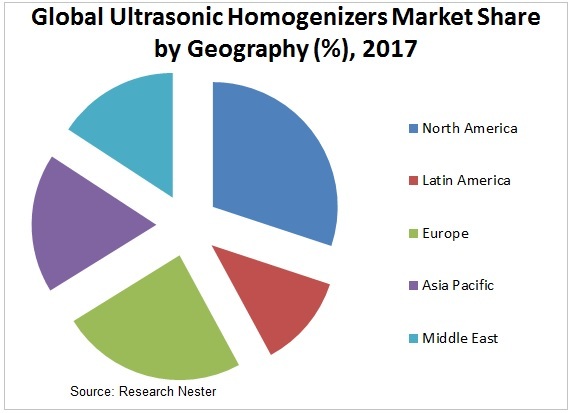 On the basis of regional platform, global Ultrasonic Homogenizers market is segmented into five major regions including North America, Europe, Asia Pacific, Latin America and Middle East & Africa region. 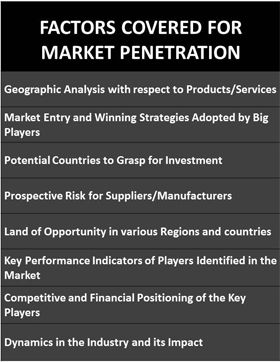 As an industrially developed region, North America is panned to observe extensive growth in ultrasonic homogenizers market on account of rising ultrasonic homogenizer’s usage in cosmetics and food processing industry. North America is estimated to be followed by Asia Pacific in terms of consumption due to expanding ultrasonic homogenizer’s requirements in chemical, medical and coating industries. 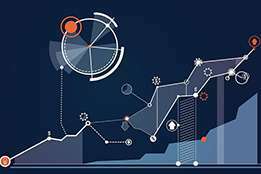 The rising demand for ultrasonic homogenizers with small vessel area accompanying high energy for various processes such as DNA shearing and others are expected to drive the market rapidly over the forecast period. 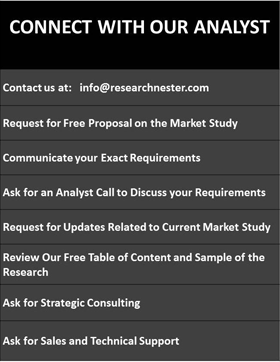 The growing R&D activities associated to ultrasonic homogenizers is further expected to expand the market growth owing to discovery of new applications on ultrasonic homogenizers. Growing food and dairy industry with technological advancements is estimated to propel the ultrasonic homogenizers market across the globe. 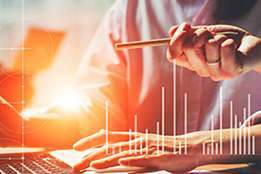 Rapid economic development with thriving manufacturing sector and booming research activities is expected to boost the ultrasonic homogenizers market in the developing regions around the world. Application of ultrasonic homogenization in energy efficient and effective functioning under intense stress and high shear to liquid and powder mixtures, simply liquids and slurries is anticipated to drive the ultrasonic homogenizers market significantly over the forecast period. Ultrasonic homogenization provides the features of dispersing, mixing, extraction, chemical reaction and size reduction for industrial as well as laboratory purposes. While ultrasonic batch homogenizers can be used for laboratory purposes continuous ultrasonic homogenizers are used for industrial purposes. Moreover, ultrasonic homogenizers function in manufacturing of dispersions and suspensions and dissolution of hard-to-dissolve and extremely hard-to-dissolve substances in fluids which is predicted to drive the market steadily over the forecast period.